Homeowners living in their primary residence aren’t the only ones at risk of going into foreclosure on their homes. Cash-strapped landlords and inheritees with high mortgages or property taxes are equally at risk. To prevent an ongoing financial burden that could potentially lead to a foreclosure, these property owners should understand the foreclosure process in CA and explore their options to find alternative solutions. 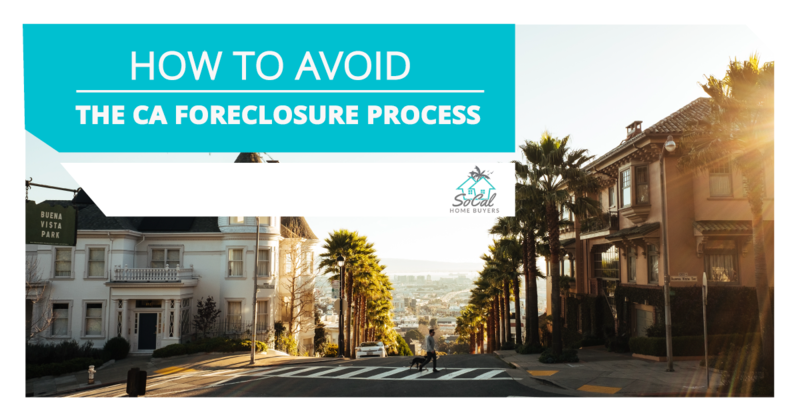 Keep reading to learn more about the foreclosure process, the California Code of Civil Procedure, and what options you have in lieu of waiting for your property to go into foreclosure. A foreclosure occurs when a home loan borrower fails to keep up with their mortgage payments and falls seriously behind. The lender can eventually seize the home after certain conditions are met. In some cases, you may voluntarily give the property over to the lender. In other cases, you may try to maintain ownership of the property for as long as possible and overcome the default. Many landlords may face foreclosure if maintenance, taxes, and insurance costs have risen beyond what you’re able to charge in rent. High vacancy rates can also turn an investment property into a liability instead of a profitable venture. If you recently inherited a home with a mortgage, you may find yourself in a similar situation. It may be too difficult to keep up with those monthly mortgage payments. Alternatively, you may find yourself in a dispute with siblings or other family members involved in the estate. If these aren’t resolved in a timely manner and payments aren’t being made on the property, you can quickly find yourself in an unfortunate situation. In addition to losing ownership of the property, a foreclosure does lasting damage to your financial health. Your credit score will drop significantly, and you’ll likely find it difficult to buy a home in the near future or qualify for other types of credit. A foreclosure generally stays on your credit report for seven years. It doesn’t matter if the property was inherited, you can still face these issues if your name is on the deed. There are two types of foreclosure you may experience: a nonjudicial foreclosure or a judicial foreclosure. Let’s walk through each type, along with the consequences associated with each one. It’s important to understand how these processes work so you can make a strategic plan to prevent them altogether since either one can be used in the state of California. 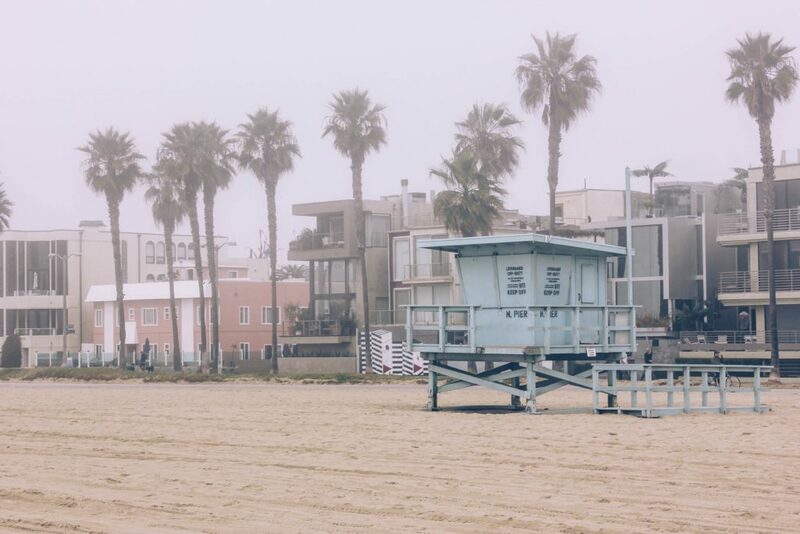 A nonjudicial foreclosure process is the most commonly used in California. 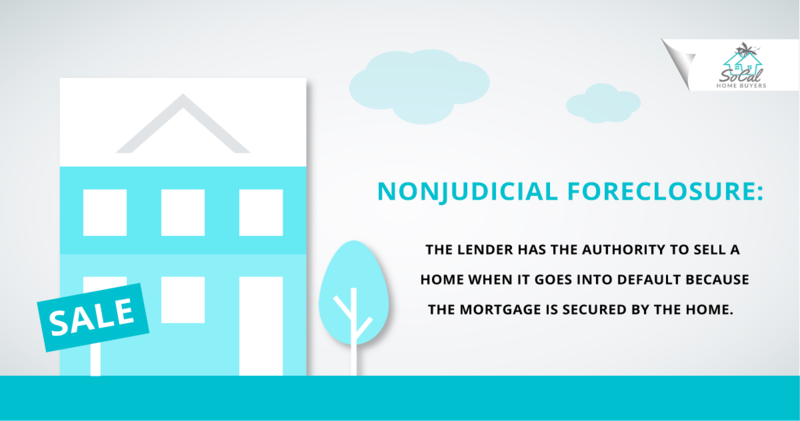 In this process, the lender has the authority to sell a home when it goes into default because the mortgage is secured by the home. This is referred to as a power-of-sale clause in the deed of trust. But before this can take place, several steps must be taken by the lender. First, the lender must contact you to learn more about your financial situation and any solutions that could help you avoid foreclosure. If you prefer, you can find a lawyer or HUD-certified counselor to help represent you during this discussion. You’re also entitled to one additional financial assessment meeting within 14 days of the first. 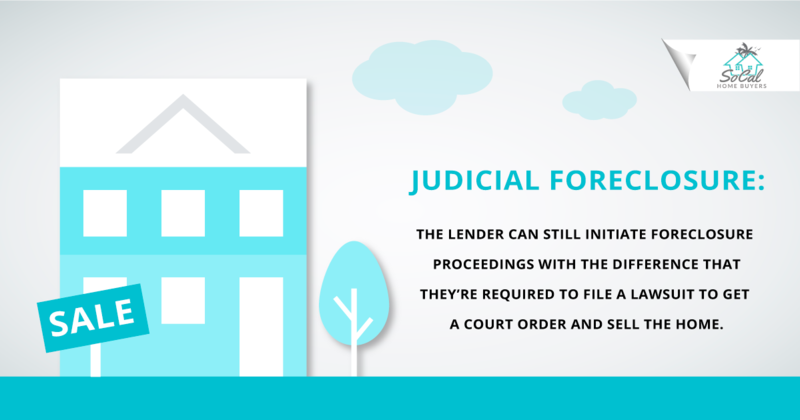 After 30 days, the lender can initiate the foreclosure process if you haven’t reached an agreement or solution. The lender starts with a Notice of Default. If you haven’t caught up with payments within 90 days, the lender can issue a Notice of Sale. It can then be sold at auction after 21 days. If the home is sold, you’ll then receive a three-day written notice to vacate the property. If your home doesn’t sell during the auction, ownership is then transferred to the lender. Landlords going through the nonjudicial foreclosure process in CA should know that their tenants have a few specific rights even if the property is being sold after default. With an existing lease, the new owner is required to honor the remaining time and allow the tenants to stay in the home until the lease expires. With a month-to-month lease, if the new owner wants to end the relationship with the tenants, they can issue a 90-day eviction notice. Some cities in California, however, have eviction and rent control laws. In these areas, a new owner may not be able to use foreclosure as a legal reason to evict tenants in an existing lease. If you’re a landlord with a foreclosure on the horizon, it could be helpful to direct your tenants to resources that help them understand their rights through the process. 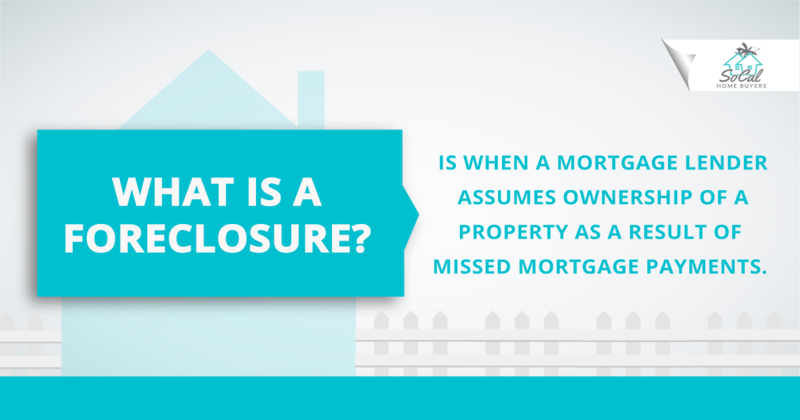 When there isn’t any power-of-sale clause in the deed of trust, the lender can still initiate foreclosure proceedings. The difference is they’re required to file a lawsuit to get a court order and sell the home. If the lender is successful in getting the court order, they can then have an auction to sell the property to the highest bidder. If the property is sold for an amount less than what is owed on the home loan, the lender can get the court to issue a deficiency judgment. This leaves you responsible for the difference in the sold amount and what you still owe on the mortgage, plus any fees, penalties, or costs incurred throughout the judicial process. On the plus side, a judicial foreclosure in California offers the original property owner the right to redemption. For one year after the auction, you are allowed to buy back the property from the auction winner. You have to pay the price the buyer paid at the auction, in addition to some other fees and charges. These can include what the buyer paid for in taxes, repair, upkeep, insurance, and interest. When you think about it, it seems like a steep slope to climb to manage all of those expenses within a year of going through the foreclosure process. It’s consequently rare for most property owners to get their property back after a judicial foreclosure, even though the door is open for it to happen. The entire judicial foreclosure process in CA is relatively rare. It’s much more expensive for lenders to take this route and it’s also a longer process. In most cases where you’re on the brink of foreclosure, you can expect to go through the nonjudicial process. No matter what your ownership scenario may be, it’s important to create a plan so you don’t have to face any type of foreclosure. You can always start off by talking to your lender to determine if there are any options to avoid entering the foreclosure process. Another helpful solution can be to get a cash buyer to avoid foreclosure. One of the benefits with this option is the cash buyer can actually negotiate with the lender directly to satisfy the debt on the property. If it works out, you’ll have a short sale listed on your credit report rather than a foreclosure, which is a better option out of the two. Ready to learn more about selling your foreclosure with a cash buyer in California? We’re here to help. Contact us anytime to take the next step in relieving this financial burden permanently.